If you follow me on Facebook, then you know that we recently spent some time at our family’s rental cabin in Blue Ridge, Georgia. We decorated the cabin Christmas tree AND we set aside some time to explore a new town not too far away: Cleveland, Tennessee. In fact, the drive between Blue Ridge and Cleveland is really beautiful, as the road winds along the Ocoee River which then becomes Lake Ocoee…and there is just something magnificent about mountainside waterways. Relics was, ironically, the last shop we hit on our itinerary…but it was an absolute favorite. It’s becoming harder and harder these days to find shops that carry 100% antiques/vintage, without bits and pieces of modern reproductions thrown in. But Relics is a pure antiques mall, with finely appointed booths that showcase loads of late 19th/early 20th century treasures. But the treasures are quirky and approachable- not stuffy- so, we had a lovely time strolling through, knowing that each ware we touched had quite the tale to tell. Right off the bat, this shop gets bonus points for sharing a parking lot with both a Goodwill AND a Habitat ReStore! That’s truly a Sadie-style Triple Threat if I ever did see one. Hard to beat parking once and hitting three spots…which is exactly what we did! But back to The Antiques Parlour…this mall is definitely the spot for primitives and Americana! I spotted Hoosier cabinets and authentic farmhouse goodies in every corner. Plus, it’s bigger than it looks, so set aside plenty of time to ensure you see everything housed inside! Sometimes I hit more thrifts than antiques shops on my junkin’ journeys, but not this time! But, you know what? That’s ok, because I found so many treasures at River of Life Thrift that I didn’t mind. In fact, I only snapped one photo inside to share with you because I was too busy shopping. 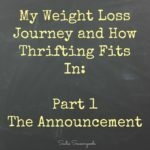 Thrift stores get a lot of flack for high prices these days, but not this one- I filled up my arms with all kinds of goodies and am already looking for an excuse to go back and shop for more. Vintage stores with shop animals (cats OR dogs) are a particular favorite of ours, and two little faces greeted us at the door before we even walked into Vintiques! This shop offers an eclectic collection that ranges from primitives/Americana, to Shabby Chic, to my personal favorite: “mantiques” (old cabin-y goodness like snowshoes and minnow buckets and old tools). I circled the mantique room several times because I knew I was missing things to admire and consider…sometimes, a shop requires more than one lap around! Walking into this shop has an Alice in Wonderland feel- the various personalities of the shop change from room to room (Feminine Boudoir! Military Bunker! Steampunk Curiosities! ), which is enticing and entertaining all on its own. But I swear, the shop grows larger and larger as you go deeper in…but what a fun place to get lost in (and don’t forget the junk yard out back!). Excellent roundup, Sarah! I always love your junkin’ journeys, thanks for sharing. We live in Washington State now, but for years on our way to Florida from Mi, every Fall and Spring, Cleveland, TN was our stop to play, and we love that town. We really watched it grow but there is still some quaintness in areas. Thanks for sharing and sparking a memory!! How sweet is that story?? Thank you, Nancy!! Sounds like a really fun place to visit! Oh, I envy you that lovely trip. I hope you will share particulars of your treasures–for yourself and to upcycle. Your pictures were lovely. Christmas prep is taking precidence over crafting (unless it’s for Christmas, of course) right now. Came through the kids’ Sun. School program successfully (thank you, God). The 3 year old that said “Merry Christmas” to the audience at the end stole the show! Such cool places to explore and discover treasures! oh, wow, what wonderful stores! Wish I could have crawled into each photo and walked around! What fun. I would need a whole weekend and then some to browse through all those lovely little shops. Oh wow, I bet that Salvation Army is SO cool! There is a Goodwill in Palm Beach that I hit whenever we visit family in West Palm Beach, and it always has the most amazing treasures for people who love labels- Louis Vuitton luggage, etc. Not really my thing, but still fascinating to find in a Goodwill, LOL! You missed two of Clevelands oldest antiques shop and our favorite consignment shop. The oldest shop houses antiques and fine collectibles of every sort with fine jewelry, military and history memorabilia throughout; from there, you’re just steps away from their two houses full of fine antique furniture and accessories, fine china, paintings and more -all- inside of Presswoods Vintage Antiques at 3350 Ocoee St. The other shop is one of Cleveland’s largest consignment stores with everything imagainable; in fact they owner says, “if they make it, we have it, if we don’t have it, they probably don’t make it”. Consign It Furniture & Accessories is located at 418 S. Ocoee St. And, next visit you don’t want to forget to stop in at one of Cleveland’s oldest hardware stores, Beaty’s Hardware at 650 Wildwood Ave. not only carries your many hardware and garden & farm needs; they have a variety of antiques and collectibles nestled inside Cleveland’s favorite and oldest home owned hardware store. Now you have several real good reasons to visit Cleveland.TN again soon. Hope while you were visiting, you picked up a Busy Bee Trader. It’ll give you reminders to all of Clevelands fantastic antiques and unique shops, as well as some wonderful ideas for day trips within a short distance from Cleveland. You’ll want to keep that cabin ready for the many things you’re going to fine to do. Thanks, Maxine – I’m sorry you weren’t happy with the shops I was able to fit in during my day trip. I do my best and rely on recommendations from friends and locals for my junkin’ journey posts. As a repurposing blogger, I also tend to stay away from shops that offer higher-end or fine antiques, for obvious reasons. I wish you the best! Come back to Cleveland anytime!!! Thank you so much, Kathy- I’m sure we will someday!